In honor of Black History month, the AHC would like to celebrate African-American experiences in the west by sharing this photograph of the Stepp family; taken on Alonzo T. Stepp’s ranch in the 1920s. Originally from Berea, Kentucky, Alonzo Stepp came to Wyoming to try cowboy life in the open space of Wyoming. First starting as a sheepherder he eventually owned his own land in Lincoln County near LaBarge, Wyoming; which stayed in the family until the 1960s, when the land was claimed by eminent domain for irrigation projects. Information about the Stepp family can be found in the John Ravage papers. 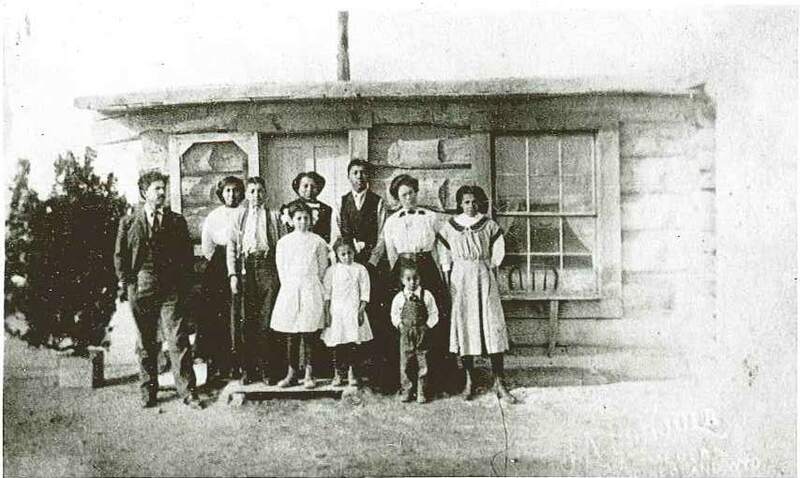 Alonzo Stepp Family in front of their homestead cabin near LaBarge, Wyoming, ca. 1920. Ranch-Stepp photograph file, American Heritage Center, University of Wyoming. The history of the Stepp family is not the only African-American story available at the AHC. Other resources regarding African-American history in the west include collections such as (and not limited to) Harriet Elizabeth Byrd, the Black 14, Joseph C. O’Mahoney, and Grace Raymond Hebard; subject and photograph files; and a popular traveling exhibit. This entry was posted in African American history, Family history, Ranch history, Western history, Wyoming history and tagged African-American history, Blacks in Wyoming, ranch history, Wyoming history. Bookmark the permalink.